Specimen collection numbers SCL 15256 (left, var. 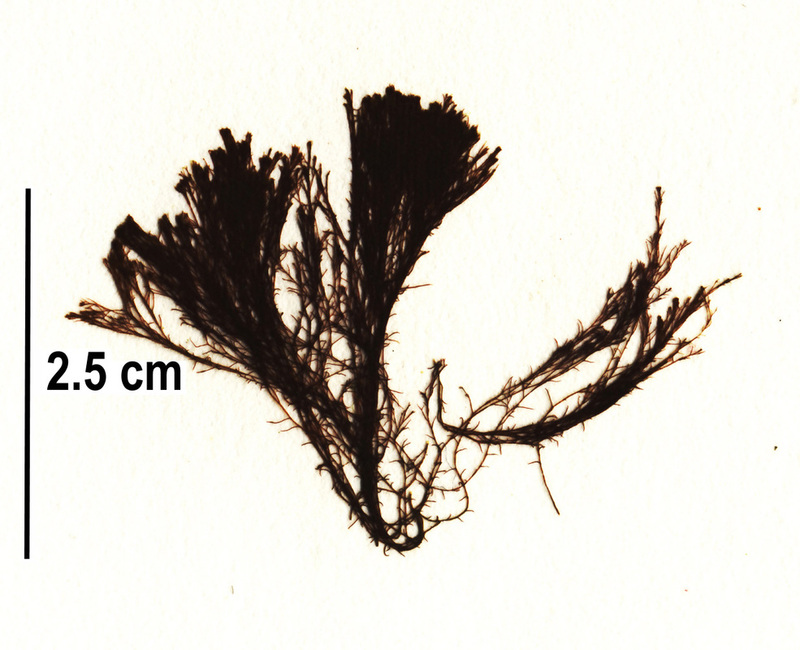 determinata, found growing on gooseneck barnacles) and SCL 15297 in the UBC Herbarium Algae Databse. Search the collection numbers in the database for more information on these specimens, or search the species for further occurrences. Images courtesy of Sandra Lindstrom. Polysiphonia species are finely-branched red algae that form clumps or mats up to 25 cm tall. Branches are thin (measuring less than 2 mm in diameter) and cylindrical. Branching is radial; when branches are spread out in water Polysiphonia species have a fluffy appearance. 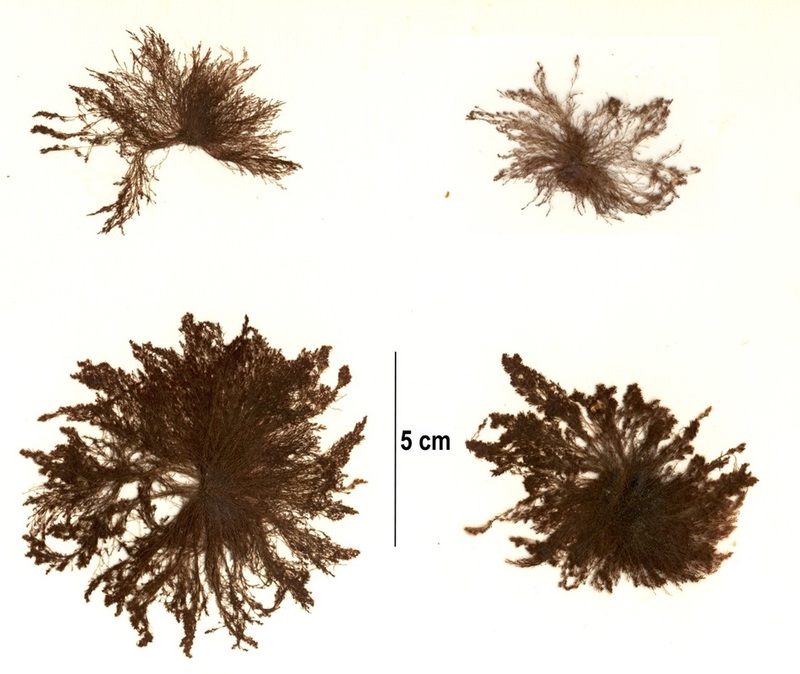 Polysiphonia species are differentiated from other finely-branched red seaweeds by a unique bundling arrangement of cell filaments; a microscope is required for accurate identification at the genus as well as species level. P. pacifica grows on rock and other hard surfaces in the low intertidal and subtidal. It inhabits protected to semi-exposed shorelines from the Aleutian Islands to Baja California, Mexico, as well as Peru. Druehl, L. 2000. Pacific Seaweeds: A guide to common seaweeds of the west coast. Harbour Publishing: Madeira Park, BC, Canada. P. 107. Gabrielson, P. W., S. C. Lindstrom and C. J. O’Kelly. (2012). Keys to the Seaweeds and Seagrasses of Southeast Alaska, British Columbia, Washington, and Oregon. Phycological Contribution No. 8, iv + 192 pp. Lindberg, M. and Lindstrom, S. (2010). Polysiphonia pacifica. Seaweeds of Alaska. Accessed 06/07/2015. Mondragon, J. and Mondragon, J. (2003). Seaweeds of the Pacific Coast: Common Marine Algae from Alaska to Baja California. Sea Challengers: Monterey, California. P. 68. O'Clair, R. and Lindstrom, S. Polysiphonia pacifica Hollenberg. In Klinkenberg, Brian. (Ed.). E-Flora BC: Electronic Atlas of the Plants of British Columbia. Lab for Advanced Spatial Analysis, Department of Geography, University of British Columbia, Vancouver. Accessed 06/07/2015.